A number of ports along the Saigon River are to be moved or converted for other purposes in a bid to ameliorate urban traffic congestion in Ho Chi Minh City and neighboring areas. The plan is in agreement with a long-term vision by the Vietnamese government regarding the development of a pan-regional cluster of ports in southeastern Vietnam, according to the Ministry of Transport. The ten ports which lie along the terminal portion of the Saigon River have been earmarked for relocation and transformation in use. Ports with the largest area in the group include Ben Nghe Port, Vietnam International Container Terminals (VICT) Port, and Saigon Port, which boasts enormous economic significance and has existed since the French colonial epoch. One of the four current components of Saigon Port– Tan Thuan Wharf, in District 7, Ho Chi Minh City – will be placed by 2020 in Hiep Phuoc, a zone of the outlying district of Nha Be, to ease the building of one out of three future bridges over the Saigon River – Thu Thiem 4 Bridge. The remaining nine ports either continue their operation without physical expansion and are subject to relocation after 2020; or have their activity ceased when the land lease contracts expire. 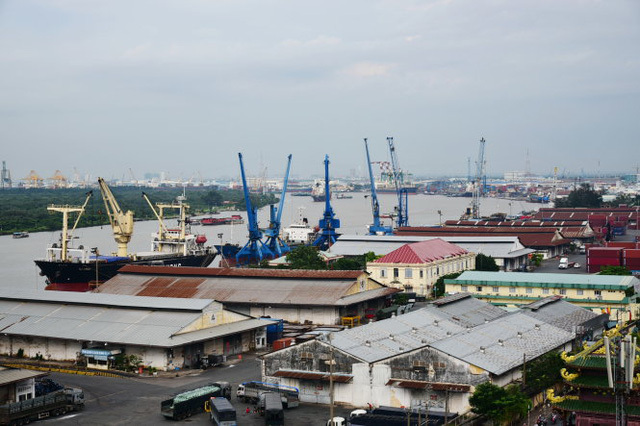 The government attaches the prime importance the to-be-built Hiep Phuoc Port, along Soai Rap River of Nha Be District, considering it as Ho Chi Minh City’s chief port in the foreseeable future. This location is expected to handle cargo ships with a carry capacity of 50,000 metric tons (in technical parlance, 50,000 DWT-Dead Weight Tonnage) or container ships with up to 4,000 TEU, where TEU stands for Twenty-foot Equivalent Unit, inexactly equal to the volume of a twenty-foot-long container. Several specialized wharfs will be constructed in the proximity of industrial facilities. The above scheme is part of the detailed planning which has been approved by Vietnam’s Ministry of Transport regarding the formation of an inter-regional hub of ports in the southeast of the country by 2020, with a vision up to 2030. This center is scheduled to consist of four main ports in Ho Chi Minh City and its nearby provinces of Dong Nai, Ba Ria-Vung Tau, Binh Duong and Long An. The port complex in Ho Chi Minh City, playing a paramount role, will have wharfs along the Saigon River; Dong Nai River; Nha Be River; and Soai Rap River, which is joined by the Saigon and empties into East Vietnam Sea. The future ports in the hub are arranged in a configuration conducive to the evenness in their paces of growth and to collective efficiency. Another goal is reduce traffic congestion in Ho Chi Minh City’s downtown by diverting the flow of freight away from the metropolis. A priority in investment by 2020 is on Cat Lai Port, in District 2, Ho Chi Minh City, one of Vietnam’s largest and most modern ports, and on transport routes linked to this location.